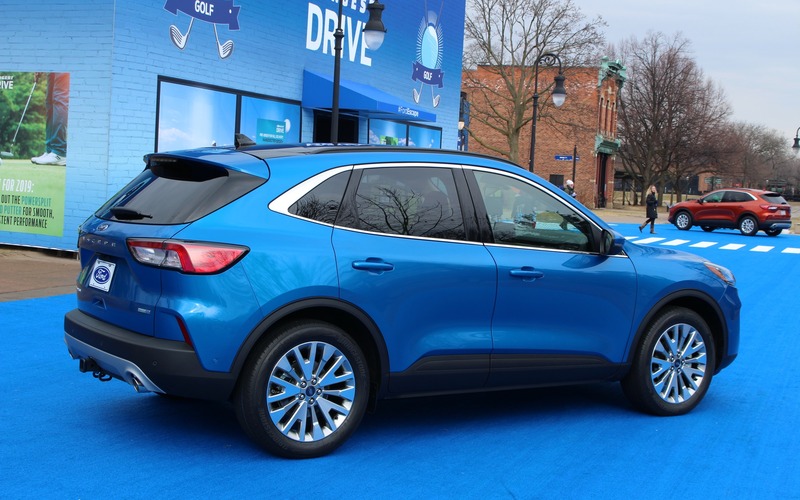 DEARBORN, Michigan – After a very successful run, the current Escape is about to be replaced by the fourth-generation model, which will go on sale in the fall of 2019. Seeking to regain its throne as the best-selling SUV in Canada, the new Escape is getting a major overhaul. And to beat the Honda CR-V and Toyota RAV4 on the sales charts, not to mention keep other segment players such as the Nissan Rogue, the Hyundai Tucson and the Mazda CX-5 at a distance, the Escape needs more than just a redesigned body and a couple of mechanical tweaks. 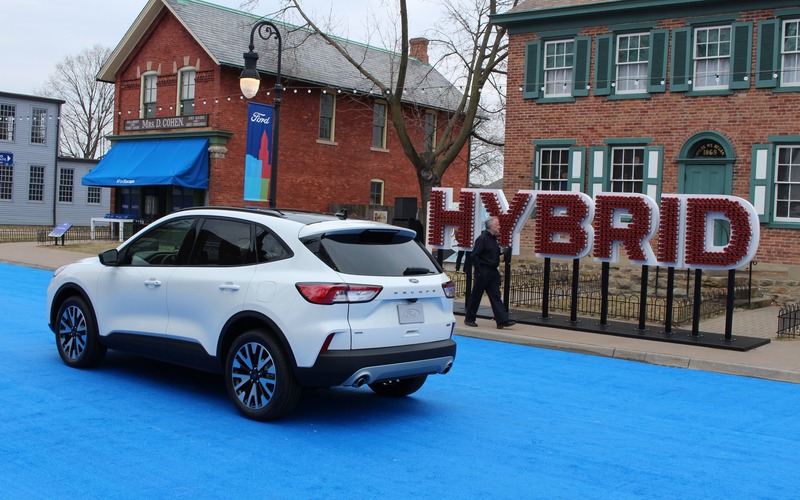 After presenting the new 2020 Ford Escape to the automotive press in Greenfield Village, it’s safe to say that the company worked hard to develop a very competitive vehicle on paper. It starts with a totally redesigned body. The 2020 Ford Escape looks nothing like the current-gen model with a rounder, softer shape that admittedly loses some uniqueness in the compact SUV segment, but looks pretty good nonetheless. The new Escape is more aerodynamic, thanks in part to an underbody shield that reduces drag, while noise, vibration and harshness are mitigated with the use of an isolated rear sub-frame (the front one was already isolated), improved door sealing, acoustic laminated side glass as well as active noise cancellation on certain versions. In Canada, four trim levels will be offered, including S, SE, SEL and Titanium, all available with front-drive and all-wheel drivetrains. The Escape is lighter by about 100 kilograms compared to the previous generation, which obviously has a positive effect on performance, fuel economy and handling. Under the hood, the Escape’s base engine is a turbocharged, 1.5-litre three-cylinder unit that is said to develop about 180 horsepower and 177 pound-feet of torque (with 93-octane fuel), married to an eight-speed automatic transmission. This new engine can shut down one piston under light loads in order to reduce fuel consumption, with transitions performed in 14 milliseconds. A turbocharged 2.0-litre four is optional in the SEL and Titanium, producing a targeted 250 horsepower and 275 pound-feet of torque (with 93-octane fuel), ready to tackle the Chevrolet Equinox, the Kia Sportage and the Mazda CX-5 which offer similar available powertrains. All-wheel drive is mandatory with the 2.0-litre engine. The fourth-generation Escape marks the return of a hybrid option, but also the introduction of a plug-in hybrid system as well. Both consist of an Atkinson-cycle, 2.5-litre four-cylinder engine, an electric propulsion motor, an electric generator motor and an electronically controlled, continuously variable automatic transmission. The hybrid gets a targeted output of 198 horsepower, a 1.1-kWh battery pack and can be chosen in FWD or AWD configuration, while the PHEV variant benefits from a projected 209 horsepower and a 14.4-kWh battery that can be recharged in 10-11 hours on a domestic power outlet or 3.5 hours on a Level 2 charger, but can’t be had with AWD. Fuel economy numbers have yet to be confirmed for the Canadian market, but Ford says the Escape PHEV can be driven on electric-only propulsion for up to 48 kilometres. The Escape hybrid should provide a total driving range of 880 km on a tank of fuel. Both can travel at speeds of up to 136 km/h without requiring the gasoline engine’s contribution. Towing capacity for the turbocharged 2.0-litre engine is rated at 1,588 kilograms (3,500 lbs. ), as is the case with the current-gen Escape. The HEV and PHEV variants will be able to tow up to 680 kg (1,500 lbs. ), and the 1.5-litre’s rating is set at 907 kg (2,000 lbs.). The 2020 Ford Escape looks smaller than before, but its wheelbase has been stretched by 20 millimetres, its overall length by 62 mm and its width without mirrors by 44 mm. The SUV’s roofline has been lowered by 5 mm. Total interior volume is up, with notable gains in rear-seat legroom (best in class just ahead of the CR-V and RAV4) as well as front and rear shoulder and hip room. On the other hand, front-seat legroom is down slightly. If rear-seat occupants get improved accommodations, it’s because Ford installed sliding cushions. When maximum cargo space isn’t needed, the bench can be pushed rearward, or vice-versa. That also explains the increase in cargo volume with the rear seat up (1,062 litres versus 964 in the old Escape), but the sloping rear window reduces maximum cargo space, dropping from 1,926 to 1,852 litres. Although the Escape hybrid’s battery is three times smaller than the one in the first- and second-gen models, rear-seat legroom and cargo space (974 litres with the rear seats up, 1,722 with the seats down) are slightly lower, but still in line with other compact SUVs. 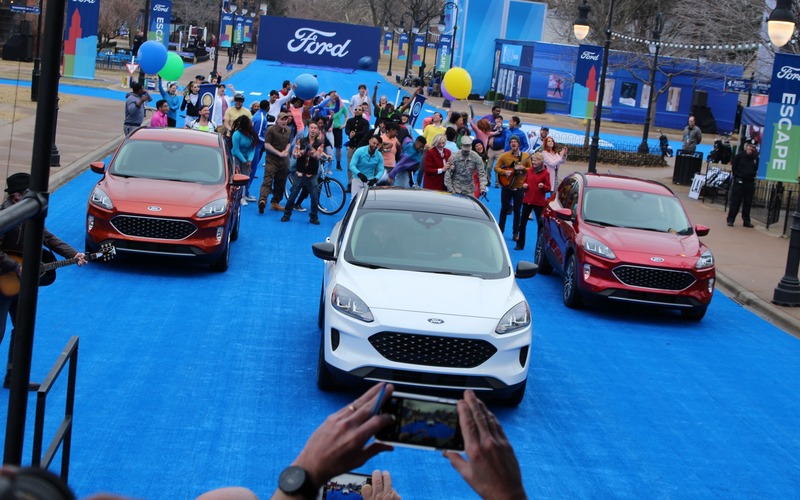 Ford said it listened to current Escape owners in order to improve the SUV’s cabin comfort and convenience. 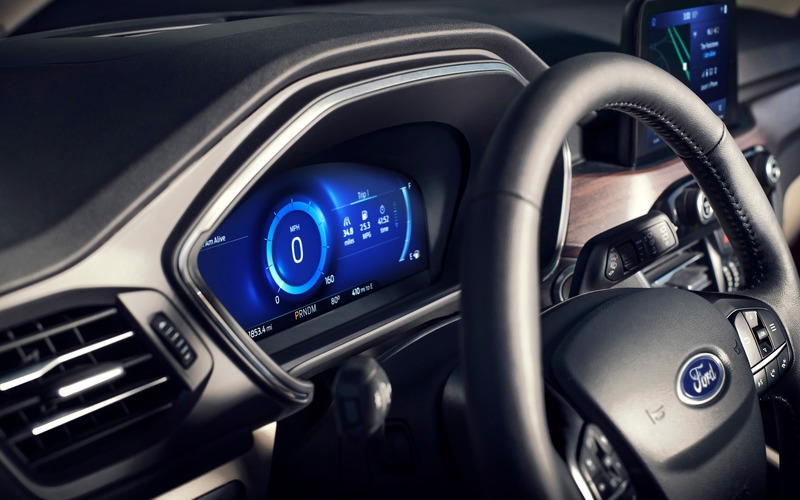 The steering column has a longer telescopic range for taller drivers, there’s a new head-up display that projects information a on flip-up six-inch visor, and a fully digital and configurable 12.3-inch driver instrument cluster is available, too. The SYNC 3 infotainment system still integrates Apple CarPlay Android Auto, while the screen features swipe and pinch capabilities. Wireless charging, a 10-speaker B&O sound system, a 4G LTE Wi-Fi hotspot (data subscription required) and up to four USB-A and USB-C ports are offered. Every Escape gets a five-mode drive system with Sport, Slippery and Snow/sand settings, even the front-drive versions. The PHEV variant also includes four electric propulsion modes: Auto EV (computer-controlled management), EV Now (gasoline engine off), EV Later (battery level conservation) and EV Charge (recharging the battery pack while driving). All trim levels of the new Escape include the Ford Co-Pilot360 suite of advanced safety gizmos. It rounds up emergency braking, lane-keep assist, blind spot monitoring, adaptive cruise control with stop and go capability, evasive steering assist as well as Active Park Assist 2.0—which parks the vehicle by itself without any throttle or brake modulation from the driver. Pricing isn’t available yet, but the redesigned 2020 Ford Escape will hit the market before the end of the year. We have yet to drive it, but from a technical standpoint, it seems as though its compact SUV rivals are in for an epic battle.